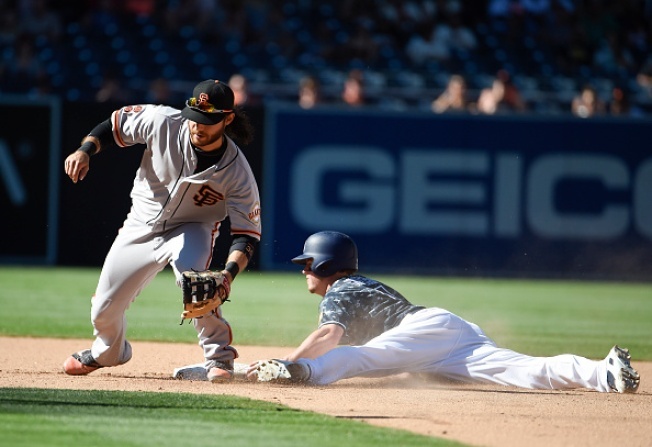 SAN DIEGO — The Giants led the National League West by eight games on June 26. On Sunday, that chase officially came to an end. The Giants lost 4-3 to the Padres just a couple of minutes after the Dodgers walked off the Rockies to clinch their fourth consecutive division title. Charlie Culberson, a former Giant, put the finishing touches on the division race with a walk-off homer. The Giants spent 123 days in first place this season, but they’re now relegated to the wild card race. It wasn’t a good day there, either. The Mets blasted the Phillies 17-0 in the morning. Ty Blach threw three innings in each of his two previous appearances, and his first big league start lasted just as long. Blach was in trouble from the start but he limited the damage. He gave up a double and walked three in a lengthy first inning, but the Padres didn’t score. Two singles and a balk did lead to a run in the second, and Adam Rosales hit a solo shot in the third. Blach was part of a three-run rally for the Giants. He tried to bunt a runner over, but Austin Hedges threw the ball away, putting two on with no outs. Kelby Tomlinson scratched a run across and Buster Posey lined a two-run single. Blach needed 76 pitches to get through his three innings, 14 coming during one lengthy battle with Wil Myers. When the bullpen took over, the slim lead disappeared. George Kontos was charged with a run in the fifth and the teams started over. The bullpens held until the seventh, when Cory Gearrin gave up a one-out triple to talented rookie Manny Margot. Myers bounced an odd single just inside the first base line to give San Diego the lead. Starting pitching report: Blach allowed just one hit in six innings in his first two appearances. He was charged with two earned Sunday on four hits and three walks. Bullpen report: It was a steady stream. The relievers, in order: Derek Law, Kontos, Steven Okert, Cory Gearrin, Will Smith and Santiago Casilla. At the plate: Posey’s single was his 999th career hit. In the field: Eduardo Nuñez was pulled after sliding into second in the seventh inning. He was diagnosed with a right hamstring strain. Attendance: The Padres announced a crowd of 28,456 human beings. The press box limited the nacho consumption by reporters. It was a disaster. Up next: A day off! It’s the final free day of the season.